I am also posting payroll manually through the Bank Feed option using QB online. I understand the posting of the payroll check as far as debiting Gross Wages and crediting the payroll liability accounts to equal the net check and then when I post the payment to the IRS through EFTPS it will zero those accounts out. However, how do I create the Payroll expense account for the Employer match portion? 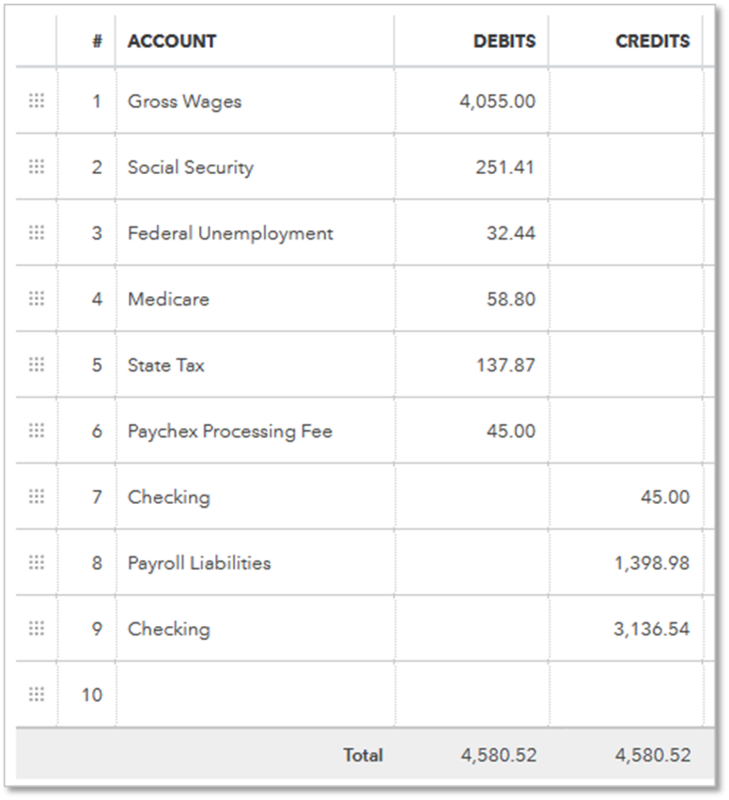 If I add a line to the bank transaction to debit the Payroll expense accounts of Social Security Match and Medicare Match, what account do I credit to balance the transaction? Go to Accounting, then Chart of Accounts. Select Expenses for Account Type, then choose the appropriate Detail Type. Type in the name of the account. Also, this article will guide which accounts to use for the employer portion of Social Security and Medicare when recording your journal entries: Record Payroll Transactions Manually. Leave a reply below if you have other questions. The linked article is showing as deleted. Is there somewhere else I can see to determine where to place the employer paid portion of the taxes? Thanks for joining the conversation. I want to make sure you're able to enter your employer paid taxes. In Quickbooks, click the Plus icon (+). Update the the paycheck date and the entry no. Please let me know how it goes, @rb9876. You got me here to help whenever you needed me. Have a great day! Today I paid for full payroll services and I need help to get payroll out tonight. I had previously purchased payroll enhanced and now all of the employee information isn't there. Can I merge them or can you take over and do it? Thank you for posting here in the Community. I'm here to assist you with any questions you may have with your subscription in QuickBooks Online. Right now, merging two different QuickBooks Online subscriptions are unavailable. You may need to record the year-to-date payroll data into the account you're currently using in the system. Set up a prior payroll. Move your lists to QuickBooks Online. As always, the Community is here if you have any additional questions related to your subscriptions. Wishing you a safe and wonderful weekend.